"Oh, yeah, I'm going down Broadway." "Working. I'm going to try to get a peek at it out the window." "I'm going up to Centennial Park. I want to be real quiet and meditative." "Our hotel's having a viewing party on the roof." "Just going out in my backyard." "I've seen one befo-er. They happen all the time. If it wasn't for my grandkids, I'd just stay home." 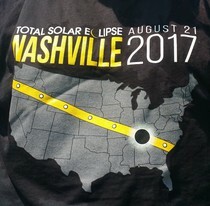 The question, posed to random strangers around Nashville, was, "Do you have plans to see the eclipse?" The last speaker, a woman at a bus stop, is of course right. Eclipses do happen all the time. 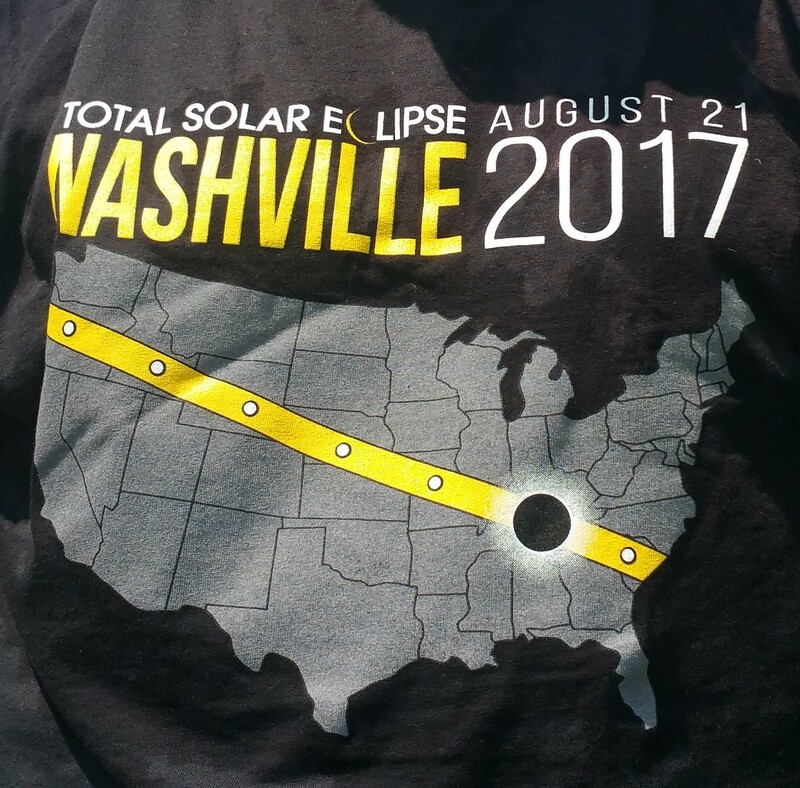 But the Great American Eclipse of 2017 was the first total solar eclipse to hit Nashville since 1478, and it's 99 years since one cut such a long and wide swath across the US - a path 70 miles wide and 2,500 miles long, stretching from the west coast of Oregon to the east coast of South Carolina. This is the also the first one with 24-hour channels to provide major event packaging. I don't remember hearing a thing about the eclipse of February 1979, even though totality covered almost the entire giant state of Montana. The Weather Channel unearthed the ABC News report, which newscaster Frank Reynolds concluded by hoping that in 38 years, "May the shadow of the moon fall on a world at peace". (Ouch.) For hundreds of small towns, the path provided a once-in-a-lifetime bonanza of visitors. T-shirts for all! (A few places, like Carbondale, Illinois, will get a second bite in 2024. 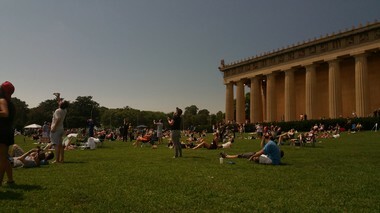 An estimated 1 million people descended on Nashville. Kids got a day off school. Opryland hosted three days of special events. The baseball team invited 10,000 people into the stadium for a viewing party, then kicked everyone out to readmit ticket holders for the (big? hah!) game. The many, many rooftop viewing parties included one at the famed music bar Tootsie's Orchid Lounge, which reportedly charged $500 per person (including free drinks). The even more famous Bluebird café seemed unimpressed; for Monday's open mic night you still had to reserve online at noon. (As if.) They had nonetheless sold out at 2:30pm. Afterwards, everyone had seen at least some part of "it". The most frustrated folks were the 8,000 people who had assembled at the Science Center. After clear skies all through the partial phases, a big, dark cloud occluded the show right before totality. "We didn't see the diamond ring, we didn't see the corona, we didn't see Baily's Beads," the on-site Weather Channel reporter lamented. The bus stop woman was right - but she was also wrong. She'd probably only seen a partial eclipse. I now know that hardly anyone who has experienced totality - the seconds or minutes when the moon fully covers the sun - says "They happen all the time." They say, "Where and when?" In 1999, when totality passed over Cornwall on its way to northern Europe, I was surprised to hear the astronomy writer Ian Ridpath say he'd been awaiting it since childhood. But in southwest London, even at 90ish% the dimming light had a glassy, almost sepia tone, and the atavistic thought, "What if it doesn't come back?" was unavoidable. 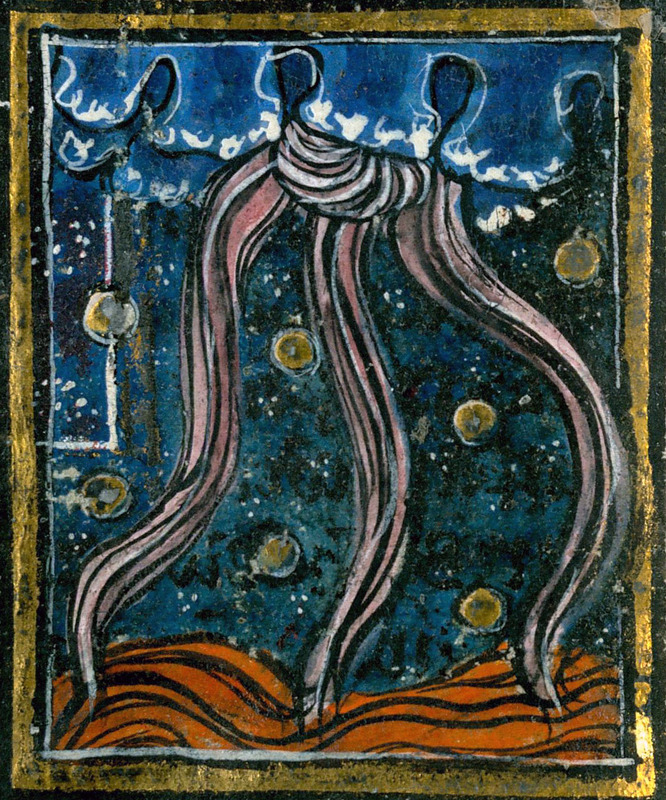 Seeing just that much created an immediate sense of direct emotional connection to our ancestors, from medieval peasants to the ancient Sumerians, and their terror at not knowing what was happening. Legends from the earliest recorded solar eclipse, in China around 2000 B.C., have the emperor ordering the astronomers executed. Here in 2017, we know. 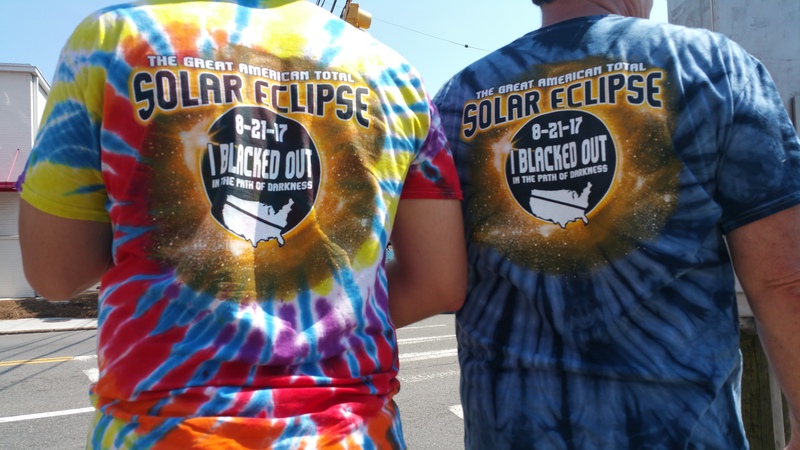 In Centennial Park, I recruited Pete, a passing retired Ohio journalist, to watch with me because I liked his eclipse T-shirt. He noted the absurdity of newscasters who cautiously said "expected at", as if the eclipse were a murder suspect whose mention required "alleged". Totality would arrive at 13:27. Were they suggesting there was mathematical doubt about this? A few minutes after noon a cheer went up: the first chip in the sun was visible. The changes in the light are slow and subtle at first, as is the temperature drop, later reported as 6 degrees (Fahrenheit). In modern life, the first clear signs are often street lights coming on, as did those behind the Parthenon's columns. Having seen it once, the 90% level was instantly recognizable. The final phases happen fast. We saw all the things the Science Center folks missed, despite the late-arriving distraction of four people with a small dog who set up nearby with 15 minutes to go. They lit incense, and produced a large, native-looking drum, and proceeded to beat it throughout totality. Did they think their activity was crucial in ensuring that the sun re-emerged at full strength? Neither moon nor sun nor annoyance intervened to prevent the sun's return to normal, on time and under budget. "Did you see it?" Replied one last accosted stranger: "It's amazing what God can do." Illustrations: The waiting audience by the Nashville Parthenon; Solar eclipse (Thomas of Cantimpré, Liber de natura rerum, France ca. 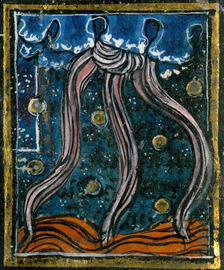 1290; Valenciennes, Bibliothèque municipale, ms. 320, fol. 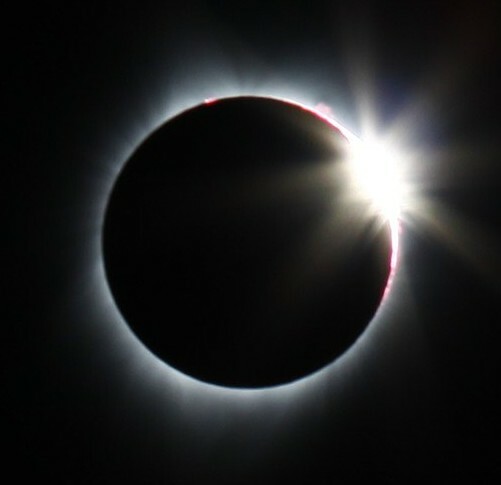 196v, via Discarding Images); eclipse T-shirts; the diamond ring effect (via Wikimedia from Tuanna2010 in Corvallis, Oregon; Nashville eclipse T-shirt.